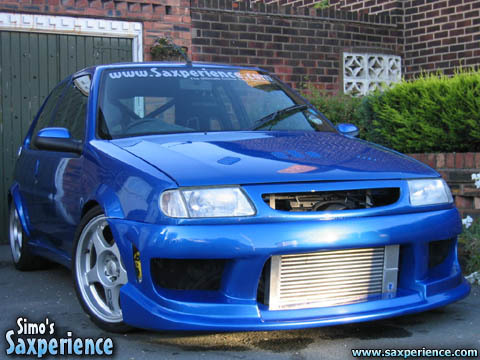 I'm not sure if the full face intercooler look is quite right, but it certainly stands out! If you see my car approaching in your rear view mirror, you know straight away that a few things have been played with under the bonnet! With the mad rush, preparing the car for the FCS, I never managed to order a new pair of mirrors, which is why the car's currently wearing it's standard electric mirrors. I sold my old mirrors along with my old front and rear bumpers! I've seen a pair of veilside mirrors, which could look fresh; something for the near future maybe? Whilst leaving the bodywork alone for a while, the next job on my list is to sort the suspension out. I'd not been happy for a while that the car was riding on standard shock absorbers and now that a front suspension 'clunk' had appeared, it was time to seriously start thinking about replacing the whole setup! The new front bumper and re-mounted intercooler are very low to the ground, so I may think about raising the ride height a little too? After all, theres no point having a powerful engine if I cant go down the road without scraping on the smallest of bumps in the road!